How do you recommend taking care of freshly colored vivid hair? "Since pre-lightened hair tends to be on the damaged side, always use a UV/color-protecting shampoo and conditioner with cold water to preserve your hair's integrity. My favorite is the Oribe Gold Lust shampoo and conditioner, which is both UV protecting and naturally sulfate-free. Additionally, washing less frequently and using products such as our Oribe Gold Lust nourishing dry shampoo will help keep fresh hues from fading too quickly. Environmental factors such as the sun and saltwater can also stress color, which is why the UV protection element of the Gold Lust line is so important to me..In terms of styling vivids, to help refresh your look and keep your color vibrant, I love using Oribe's Mystify Restyling Spray, which extends the life of your blowout and prevents unnecessary heat damage." Looking to take the plunge and completely revamp your style with a funky hair color? 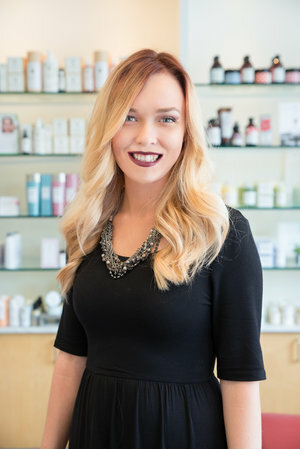 Look no further than our master stylist Kelly, whose expertise in vivid and fashion colors is unsurpassed here at Citrine! Kelly is our go-to for any unique shades, ranging from pastels to deep jewel tones. Like a true artist, she is always excited to try out new color combinations and styles! Fashion colors work differently than traditional colors because they only stain the top of the hair shaft. As a result, hair often has to be pre-lightened to truly achieve a vibrant hue. This can be a daunting process for many, so finding a stylist with experience and integrity is vital! What drew you to the fashion side of colors once you started in the hair industry? "I love the creativeness that this side of the industry brings. You never get a boring vivid color! There is always something to change whether it be the pattern/ color/shade/tone or season. Fortunately, Citrine offers special ordering for fashion hues, which has greatly expanded the palette of colors I am able to work with. That means the opportunities to create stunning looks are truly endless!" What brand do you prefer to work with? "Pulp Riot. The colors are so bright and fade beautifully!" What is the best part of getting to do fashion colors? "The best part of getting to do fashion colors is the endless opportunity for creativity and the custom work that comes with it! I love a client that likes to turn heads when they walk in the room and that makes it all worthwhile!"